Test Lab: The All-Purpose Hair Product by Port Products | Valet. 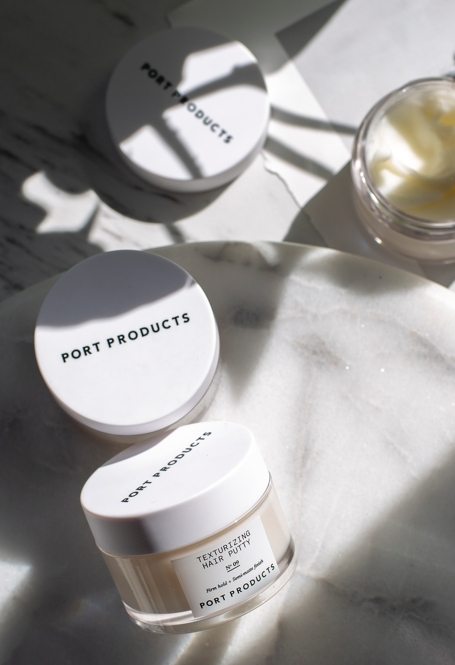 Port Products' Texturizing Hair Putty ($22), a water-based grooming paste that promises "medium hold with low shine." We tried this on a range of hairstyles, from tightly cropped and parted to more relaxed and slightly shaggy. It has a faint, minty scent that one tester said reminded him "of school paste, but in a good way." In the jar, the putty has a thick, stiff texture but quickly softens once you put a dab in your palm and emulsify it by rubbing your hands together. A finger tip's worth goes a long way. What sets this product above other similar pastes and creams is that it works for pretty much anyone—whether your hair is thick and curly or thinner and fine. If you want a stronger hold, use a bit more with damp hair. For a more natural, relaxed hold, use it on fully towel-dried hair. Work it in from the root to the tip and your hair stays soft enough to be touched while still maintaining its shape, yet pliable enough to get moved around. Unlike other products boasting a matte finish which can leave hair looking dry and dull, this gives hair a nice texture with a natural sheen without looking too shiny (or feeling stiff and sticky). And we're not sure if there are any conditioners in here, but most testers found that the texture of their hair was noticeably softer and healthier after using this for a few weeks. In short, this is the product to use if you hate the look and feeling of too much product in your hair. How often do you get your hair cut? Probably not enough. Here's how to get on a proper cut schedule. Put the body wash down. Insider secrets on strengthening a thin mane.